I love a good Greek salad. 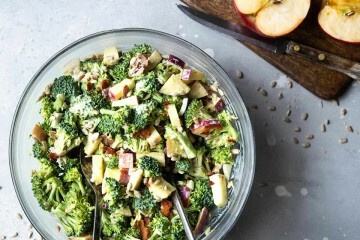 It is one of my favorite salads to make and to order when we dine out. 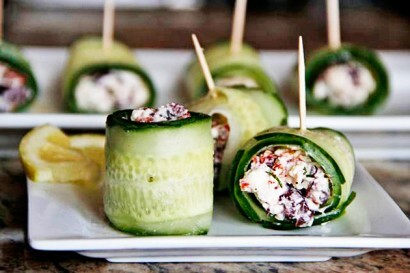 When I saw Lotta Maddness’s recipe for Cucumber Feta Rolls on Tasty Kitchen, I immediately thought: Genius! Why didn’t I think of that! 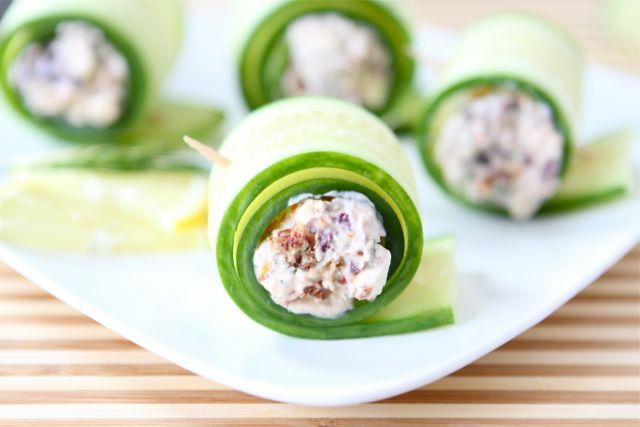 The rolls have all of the fabulous flavors of a Greek salad, but in a cute little cucumber roll. I knew I had to make them. 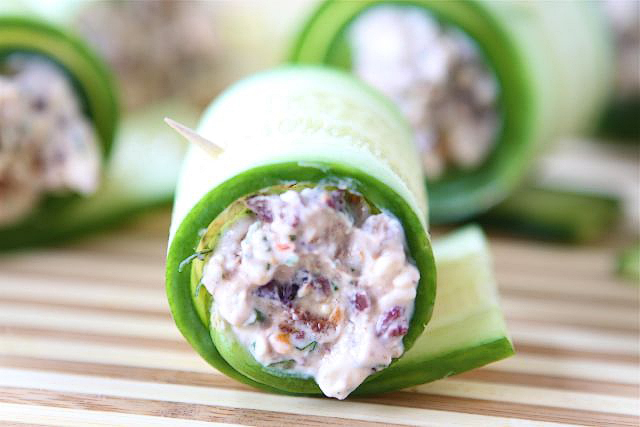 To make the rolls, you will need: an English cucumber, dill, sun-dried tomatoes, kalamata olives, Greek yogurt, feta cheese, lemon juice, and black pepper. Simple, right? 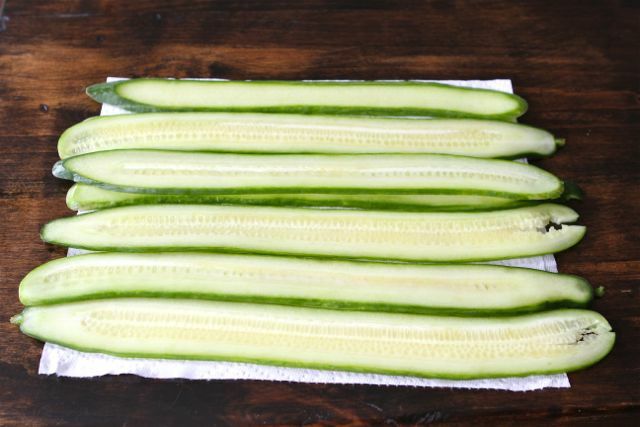 Using a mandoline (or a sharp vegetable peeler), slice the cucumber lengthwise into long thin strips. Place the cucumber strips on a towel to absorb the liquid. Chop the dill, sun-dried tomatoes and olives (make sure you remove the pits) into smaller pieces. 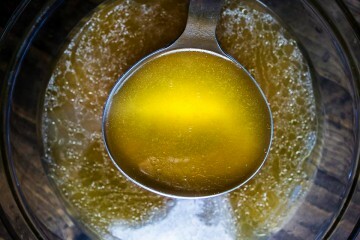 Mix together the Greek yoghurt, feta and lemon juice in a bowl until blended. Next, add the dill, sun-dried tomatoes and olives to the feta mixture and season with pepper. Place one strip of cucumber on a cutting board. 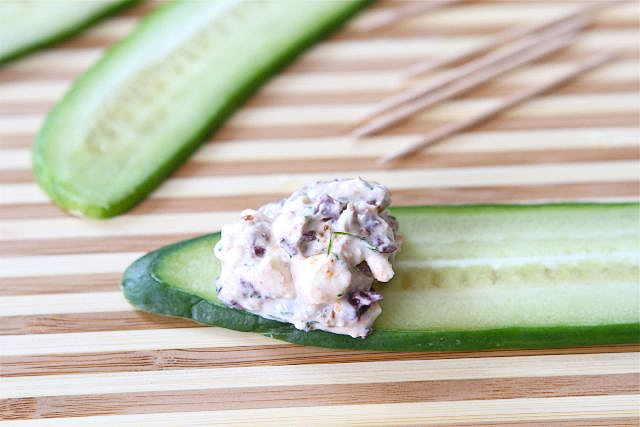 Place about a teaspoon of the feta mixture onto one end of the cucumber strip. Roll up the cucumber strip and secure with a toothpick. I had so much fun making these rolls! And the best part, you get to eat them when you are finished playing! 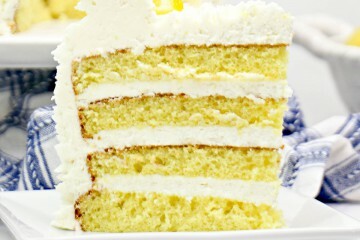 I loved the creamy Greek yogurt and feta filling. The kalamata olives, sun-dried tomatoes, dill, and lemon gave the rolls the perfect punch of flavor. The cucumber wrapped everything up nicely and provided a nice crunch. 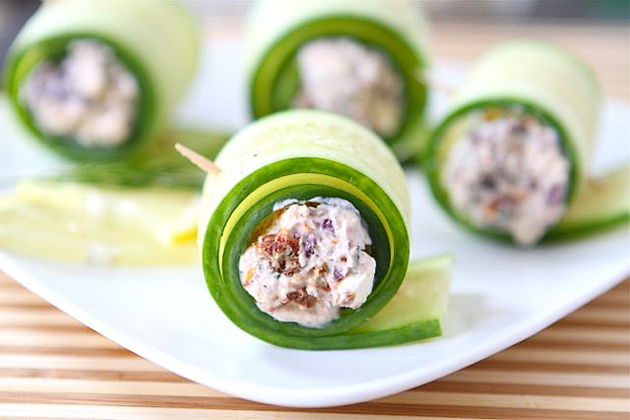 These Cucumber Feta Rolls make a great party appetizer. Not in the mood to party? 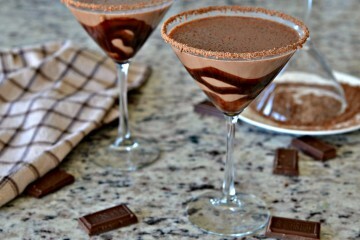 Make them for yourself! I made them for lunch and served pita bread on the side. So tasty! 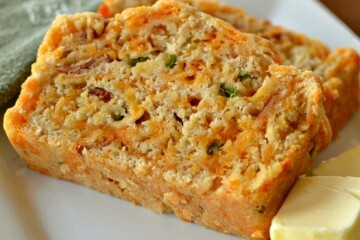 Thanks Traci for sharing your creative recipe! 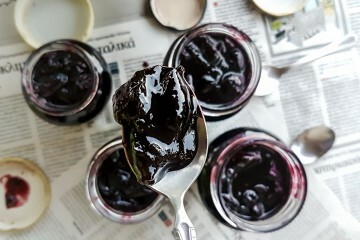 Visit Lotta Maddness for other delicious recipes, travel tips, DIY projects, and more! 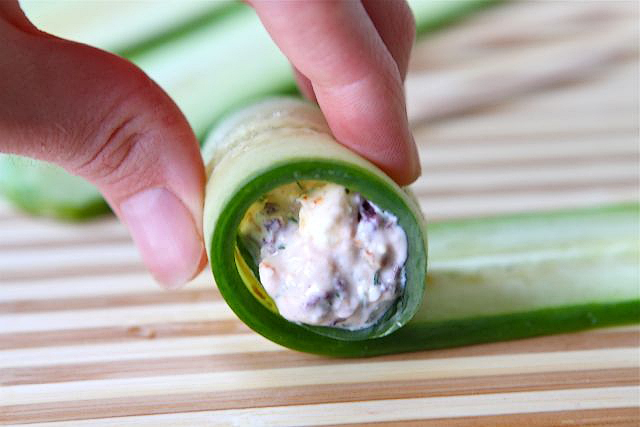 Greek salad in a rolled up cucumber strip. Start by slicing the cucumber in half lengthwise. 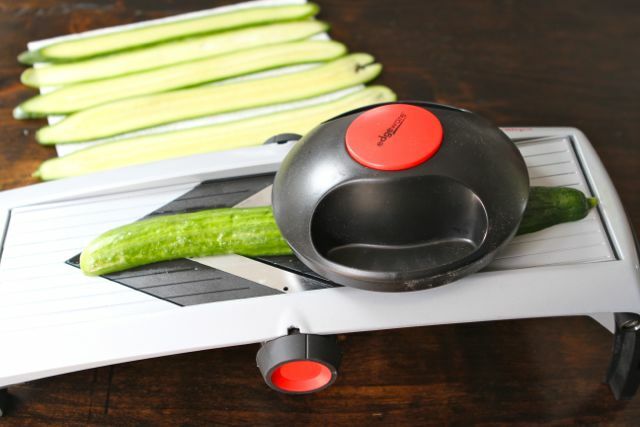 Then, using a mandoline (or a sharp vegetable peeler), slice the cucumber lengthwise into long thin strips. Place the cucumber strips on a kitchen towel to absorb the liquid. 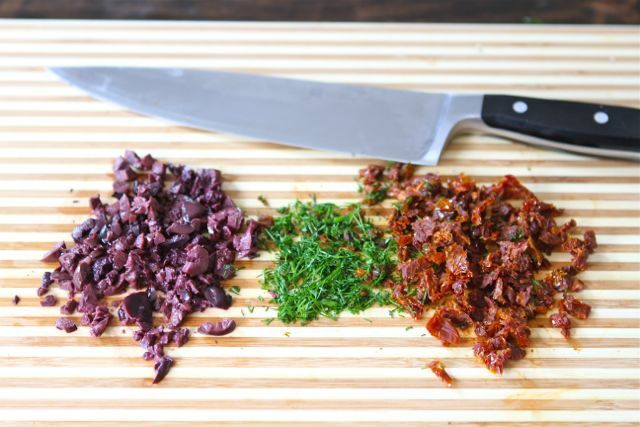 Chop the dill, sun-dried tomatoes and olives into smaller pieces. 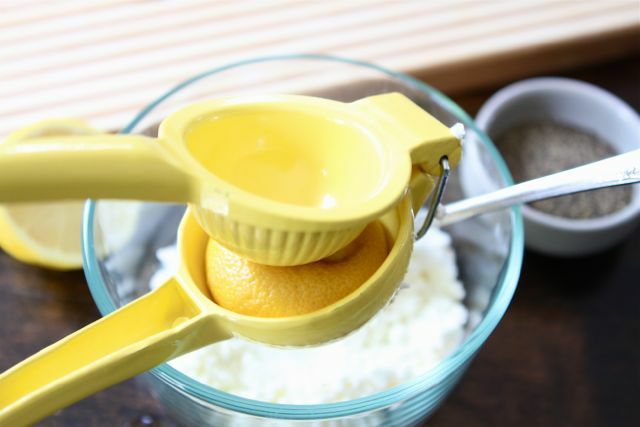 Mix together the Greek yoghurt, feta and lemon juice in a bowl until blended. 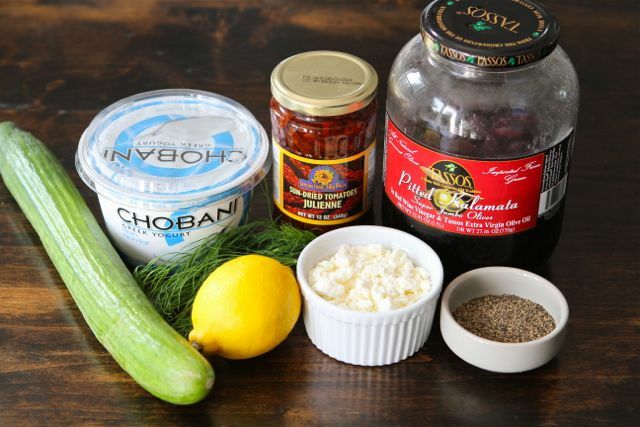 Next, add the dill, sun-dried tomatoes and olives to the feta mixture and season with pepper. Place one strip of cucumber on a chopping board. 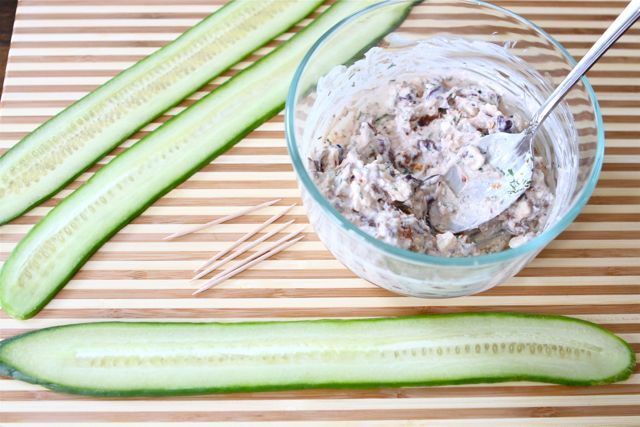 Place a teaspoon of the feta mixture onto one end of the cucumber strip. Roll up the cucumber strip and secure with a toothpick. Chill until ready to serve. Maris Callahan is the author of In Good Taste, where she writes fresh, simple recipes for young professionals and busy cooks. When she isn’t working on her next recipe she is usually reading, writing, eating—or doing a combination of all three. 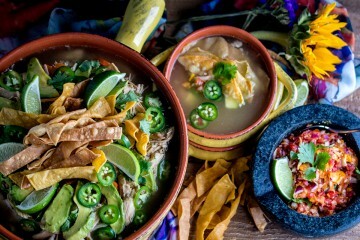 Looks delicious, I can’t wait to make this! 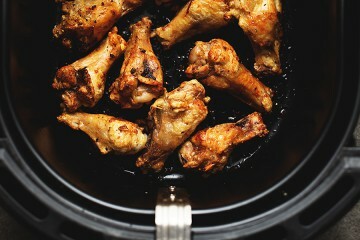 Heather L, just try it with some sour cream. 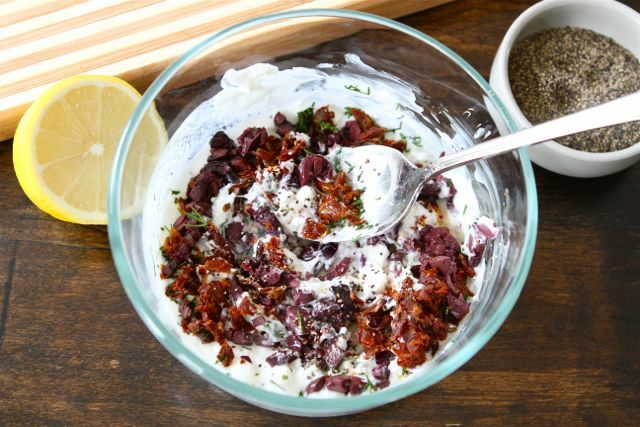 My big fat Greek family has been making tsatsiki with sour cream long before Greek yogurt hit the market. 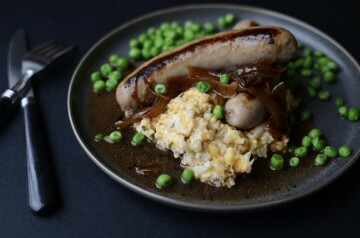 This recipe looks like delish- I would add some garlic to make it authentic. Add a grandmother who calls you koukla and gives you wet kisses after eating the garlicky treats, and you’re totally there! 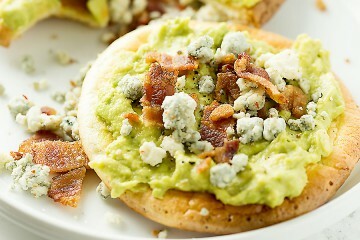 I’m dying to try these but I need a good suggestion for a Greek yogurt substitute first. I just can’t enjoy it no matter how much I *want* to like it. 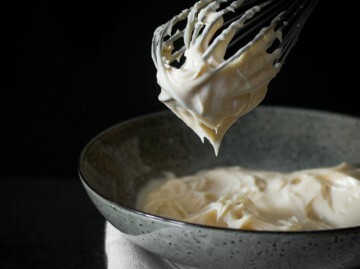 Mayo, sour cream, some kind of Kraft salad dressing? What a great idea! Will have to try. I first learned of feta cheese as a child from my Greek grandparents when they served it with watermelon! The perfect compliment. So that’s what I always associate it with 50 years later. I’m not sure how I could *not* be in the mood to party after seeing these adorable appetizers. 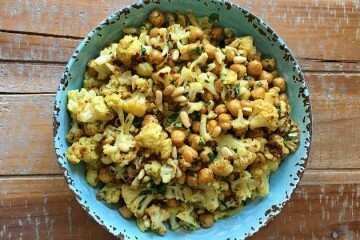 I can’t wait to try this and other complementary fillings–thank you so much for sharing! Sounds yummy! I am going to have to try this combo. I would certainly make these rolls for a shower or party, but for my lazy everyday self, I think I’ll just add the cucumber in (chopped) & spoon it into hearts of romaine leaves. 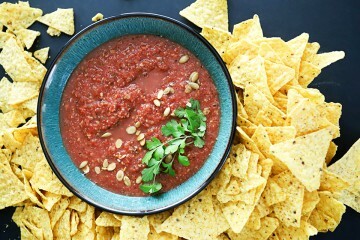 To Becky- I love fresh tomatoes, but sun dried tend to not like me (burp! ), so I think I’m going to substitute in- seeded tomato or cherry tomato. Thinking about you- how about thin sliced or chopped red peppers (will add the same sweetness tomatoes do) or roasted red peppers chopped? 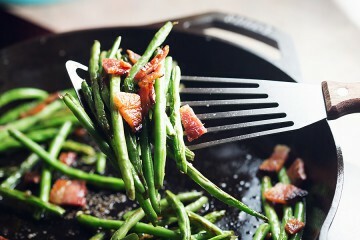 Any ideas for substituting something else for the sundried tomatoes? I dislike tomatoes and especially sundried. Um, yum. Seriously. This is the type of snack that I’d be in trouble with. Make a plate of these and some grown up cucumber mint lemonda (http://lollingabout.wordpress.com/2011/06/29/wasted-wednesday-super-fresh-lemonade/) and it’s pretty much heaven. Not really my cup of tea but I love the photos.